A quantum dot is a nanocrystal made of semiconductor materials that are small enough to exhibit quantum mechanical properties. Specifically, its excitons are confined in all three spatial dimensions. The electronic properties of these materials are intermediate between those of bulk semiconductors and of discrete molecules. Quantum dots were discovered in a glass matrix by Alexei Ekimov and in colloidal solutions by Louis E. Brus. The term “quantum dot” was coined by Mark Reed. Researchers have studied applications for quantum dots in transistors, solar cells, LEDs, and diode lasers. They have also investigated quantum dots as agents for medical imaging and as possible qubits in quantum computing. The first commercial release of a product utilizing quantum dots was the Sony XBR X900A series of flat panel televisions released in 2013. Electronic characteristics of a quantum dot are closely related to its size and shape. For example, the band gap in a quantum dot which determines the frequency range of emitted light is inversely related to its size. In fluorescent dye applications the frequency of emitted light increases as the size of the quantum dot decreases. Consequently, the color of emitted light shifts from red to blue when the size of the quantum dot is made smaller. 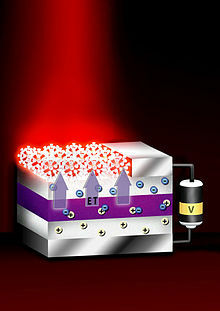 This allows the excitation and emission of quantum dots to be highly tunable. Since the size of a quantum dot may be set when it is made, its conductive properties may be carefully controlled. Quantum dot assemblies consisting of many different sizes, such as gradient multi-layer nanofilms, can be made to exhibit a range of desirable emission properties. In a semiconductor crystallite whose diameter is smaller than the size of its exciton Bohr radius, the excitons are squeezed, leading to quantum confinement. The energy levels can then be modeled using the particle in a box model in which the energy of different states is dependent on the length of the box. Quantum dots are said to be in the ‘weak confinement regime’ if their radii are on the order of the exciton Bohr radius; quantum dots are said to be in the ‘strong confinement regime’ if their radii are smaller than the exciton Bohr radius. If the size of the quantum dot is small enough that the quantum confinement effects dominate (typically less than 10 nm), the electronic and optical properties are highly tunable. The band gap can become larger in the strong confinement regime where the size of the quantum dot is smaller than the Exciton Bohr radius ab* as the energy levels split up. This results in the increase in the total emission energy (the sum of the energy levels in the smaller band gaps in the strong confinement regime is larger than the energy levels in the band gaps of the original levels in the weak confinement regime) and the emission at various wavelengths; which is precisely what happens in the sun, where the quantum confinement effects are completely dominant and the energy levels split up to the degree that the energy spectrum is almost continuous, thus emitting white light. There is Coulomb attraction between the negatively charged electron and the positively charged hole. The negative energy involved in the attraction is proportional to Rydberg’s energy and inversely proportional to square of the size-dependent dielectric constant of the semiconductor. When the size of the semiconductor crystal is smaller than the Exciton Bohr radius, the Coulomb interaction must be modified to fit the situation. where μ is the reduced mass, a is the radius, me is the free electron mass, mh is the hole mass, and εr is the size-dependent dielectric constant. Although the above equations were derived using simplifying assumptions, the implications are clear; the energy of the quantum dots is dependent on their size due to the quantum confinement effects, which dominate below the critical size leading to changes in the optical properties. This effect of quantum confinement on the quantum dots has been experimentally verified and is a key feature of many emerging electronic structures. There are several ways to confine excitons in semiconductors, resulting in different methods to produce quantum dots. In general, quantum wires, wells and dots are grown by advanced epitaxial techniques in nanocrystals produced by chemical methods or by ion implantation, or in nanodevices made by state-of-the-art lithographic techniques. Colloidal semiconductor nanocrystals are synthesized from precursor compounds dissolved in solutions, much like traditional chemical processes. The synthesis of colloidal quantum dots is done by using precursors, organic surfactants, and solvents. Heating the solution at high temperature, the precursors decompose forming monomers which then nucleate and generate nanocrystals. The temperature during the synthetic process is a critical factor in determining optimal conditions for the nanocrystal growth. It must be high enough to allow for rearrangement and annealing of atoms during the synthesis process while being low enough to promote crystal growth. The concentration of monomers is another critical factor that has to be stringently controlled during nanocrystal growth. The growth process of nanocrystals can occur in two different regimes, “focusing” and “defocusing”. At high monomer concentrations, the critical size (the size where nanocrystals neither grow nor shrink) is relatively small, resulting in growth of nearly all particles. In this regime, smaller particles grow faster than large ones (since larger crystals need more atoms to grow than small crystals) resulting in “focusing” of the size distribution to yield nearly monodisperse particles. The size focusing is optimal when the monomer concentration is kept such that the average nanocrystal size present is always slightly larger than the critical size. Over time, the monomer concentration diminishes, the critical size becomes larger than the average size present, and the distribution “defocuses”. There are colloidal methods to produce many different semiconductors. Typical dots are made of binary compounds such as lead sulfide, lead selenide, cadmium selenide,cadmium sulfide, indium arsenide, and indium phosphide. Dots may also be made from ternary compounds such as cadmium selenide sulfide. These quantum dots can contain as few as 100 to 100,000 atoms within the quantum dot volume, with a diameter of 10 to 50 atoms. This corresponds to about 2 to 10 nanometers, and at 10 nm in diameter, nearly 3 million quantum dots could be lined up end to end and fit within the width of a human thumb. Self-assembled quantum dots are typically between 5 and 50 nm in size. Quantum dots defined by lithographically patterned gateelectrodes, or by etching on two-dimensional electron gases in semiconductor heterostructures can have lateral dimensions exceeding 100 nm. Some quantum dots are small regions of one material buried in another with a larger band gap. These can be so-called core–shell structures, e.g., with CdSe in the core and ZnS in the shell or from special forms of silica called ormosil. Quantum dots sometimes occur spontaneously in quantum well structures due to monolayer fluctuations in the well’s thickness. Self-assembled quantum dots nucleate spontaneously under certain conditions during molecular beam epitaxy (MBE) and metallorganic vapor phase epitaxy (MOVPE), when a material is grown on a substrate to which it is not lattice matched. The resultingstrain produces coherently strained islands on top of a two-dimensional wetting layer. This growth mode is known as Stranski–Krastanov growth. The islands can be subsequently buried to form the quantum dot. This fabrication method has potential for applications in quantum cryptography (i.e. single photon sources) and quantum computation. The main limitations of this method are the cost of fabrication and the lack of control over positioning of individual dots. Individual quantum dots can be created from two-dimensional electron or hole gases present in remotely doped quantum wells or semiconductor heterostructures calledlateral quantum dots. The sample surface is coated with a thin layer of resist. A lateral pattern is then defined in the resist by electron beam lithography. This pattern can then be transferred to the electron or hole gas by etching, or by depositing metal electrodes (lift-off process) that allow the application of external voltages between the electron gas and the electrodes. Such quantum dots are mainly of interest for experiments and applications involving electron or hole transport, i.e., an electrical current. The quantum dot absorption features correspond to transitions between discrete,three-dimensional particle in a box states of the electron and the hole, both confined to the same nanometer-size box.These discrete transitions are reminiscent of atomic spectra and have resulted in quantum dots also being called artificial atoms. CMOS technology can be employed to fabricate silicon quantum dots. Ultra small (L=20 nm, W=20 nm) CMOS transistors behave as single electron quantum dots when operated at cryogenic temperature over a range of −269 °C (4 K) to about −258 °C (15 K). The transistor displays Coulomb blockade due to progressive charging of electrons one by one. 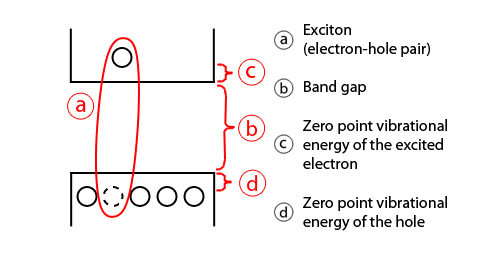 The number of electrons confined in the channel is driven by the gate voltage, starting from an occupation of zero electrons, and it can be set to 1 or many. Lee et al. (2002) reported using genetically engineered M13 bacteriophage viruses to create quantum dot biocomposite structures. As a background to this work, it has previously been shown that genetically engineered viruses can recognize specific semiconductor surfaces through the method of selection by combinatorial phage display. Additionally, it is known that liquid crystalline structures of wild-type viruses (Fd, M13, and TMV) are adjustable by controlling the solution concentrations, solution ionic strength, and the external magnetic field applied to the solutions. Consequently, the specific recognition properties of the virus can be used to organize inorganic nanocrystals, forming ordered arrays over the length scale defined by liquid crystal formation. Using this information, Lee et al. (2000) were able to create self-assembled, highly oriented, self-supporting films from a phage and ZnS precursor solution. This system allowed them to vary both the length of bacteriophage and the type of inorganic material through genetic modification and selection. Quantum dot manufacturing relies on a process called “high temperature dual injection” which has been scaled by multiple companies for commercial applications that require large quantities (hundreds of kilograms to tonnes) of quantum dots. This is a reproducible production method that can be applied to a wide range of quantum dot sizes and compositions. Recently a consortium of U.S. and Dutch companies reported a “milestone” in high volume quantum dot manufacturing by applying the traditional high temperature dual injection method to a flow system. However as of 2011, applications using bulk-manufactured quantum dots are scarcely available. In many regions of the world there is now a restriction or ban on the use of heavy metals in many household goods which means that most cadmium based quantum dots are unusable for consumer-goods applications. For commercial viability, a range of restricted, heavy metal-free quantum dots has been developed showing bright emissions in the visible and near infra-red region of the spectrum and have similar optical properties to those of CdSe quantum dots. Among these systems are InP/ZnS and CuInS/ZnS, for example. 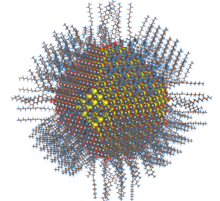 Cadmium and other restricted heavy metals used in conventional quantum dots are of major concern in commercial applications. For Quantum Dots to be commercially viable in many applications they must not contain cadmium or other restricted heavy metal elements. The environmental impact of bulk manufacturing and consumption of quantum dots is currently undergoing studies in both private and public labs. An immediate optical feature of colloidal quantum dots is their color. While the material which makes up a quantum dot defines its intrinsic energy signature, the nanocrystal’s quantum confined size is more significant at energies near the band gap. Thus quantum dots of the same material, but with different sizes, can emit light of different colors. The physical reason is the quantum confinement effect. The larger the dot, the redder (lower energy) its fluorescence spectrum. Conversely, smaller dots emit bluer (higher energy) light. The coloration is directly related to the energy levels of the quantum dot. Quantitatively speaking, the bandgap energy that determines the energy (and hence color) of the fluorescent light is inversely proportional to the size of the quantum dot. Larger quantum dots have more energy levels which are also more closely spaced. This allows the quantum dot to absorb photons containing less energy, i.e., those closer to the red end of the spectrum. Recent articles in Nanotechnology and in other journals have begun to suggest that the shape of the quantum dot may be a factor in the coloration as well, but as yet not enough information is available. Furthermore, it was shown that the lifetime of fluorescence is determined by the size of the quantum dot. Larger dots have more closely spaced energy levels in which the electron-hole pair can be trapped. Therefore, electron-hole pairs in larger dots live longer causing larger dots to show a longer lifetime. As with any crystalline semiconductor, a quantum dot’s electronic wave functions extend over the crystal lattice. Similar to a molecule, a quantum dot has both a quantizedenergy spectrum and a quantized density of electronic states near the edge of the band gap. Quantum dots can be synthesized with larger (thicker) shells (CdSe quantum dots with CdS shells). The shell thickness has shown direct correlation to the spectroscopic properties of the particles like lifetime and emission intensity, but also to the stability. Quantum dots are particularly significant for optical applications due to their high extinction coefficient. In electronic applications they have been proven to operate like asingle electron transistor and show the Coulomb blockade effect. Quantum dots have also been suggested as implementations of qubits for quantum information processing. The ability to tune the size of quantum dots is advantageous for many applications. For instance, larger quantum dots have a greater spectrum-shift towards red compared to smaller dots, and exhibit less pronounced quantum properties. Conversely, the smaller particles allow one to take advantage of more subtle quantum effects. Researchers at Los Alamos National Laboratory have developed a device that efficiently produces visible light, through energy transfer from thin layers of quantum wells to crystals above the layers. Being zero-dimensional, quantum dots have a sharper density of states than higher-dimensional structures. As a result, they have superior transport and optical properties, and are being researched for use in diode lasers, amplifiers, and biological sensors. Quantum dots may be excited within a locally enhanced electromagnetic field produced by gold nanoparticles, which can then be observed from the surface plasmon resonance in the photoluminescent excitation spectrum of (CdSe)ZnS nanocrystals. High-quality quantum dots are well suited for optical encoding and multiplexing applications due to their broad excitation profiles and narrow/symmetric emission spectra. The new generations of quantum dots have far-reaching potential for the study of intracellular processes at the single-molecule level, high-resolution cellular imaging, long-term in vivo observation of cell trafficking, tumor targeting, and diagnostics. Quantum dot technology is one of the most promising candidates for use in solid-state quantum computation. By applying small voltages to the leads, the flow of electrons through the quantum dot can be controlled and thereby precise measurements of the spin and other properties therein can be made. With several entangled quantum dots, or qubits, plus a way of performing operations, quantum calculations and the computers that would perform them might be possible. In modern biological analysis, various kinds of organic dyes are used. However, with each passing year, more flexibility is being required of these dyes, and the traditional dyes are often unable to meet the expectations. To this end, quantum dots have quickly filled in the role, being found to be superior to traditional organic dyes on several counts, one of the most immediately obvious being brightness (owing to the high extinction co-efficient combined with a comparable quantum yield to fluorescent dyes) as well as their stability (allowing much less photobleaching). It has been estimated that quantum dots are 20 times brighter and 100 times more stable than traditional fluorescent reporters. For single-particle tracking, the irregular blinking of quantum dots is a minor drawback. The usage of quantum dots for highly sensitive cellular imaging has seen major advances over the past decade. The improved photostability of quantum dots, for example, allows the acquisition of many consecutive focal-plane images that can be reconstructed into a high-resolution three-dimensional image. Another application that takes advantage of the extraordinary photostability of quantum dot probes is the real-time tracking of molecules and cells over extended periods of time. Antibodies, streptavidin, peptides, DNA, nucleic acid aptamers, or small-molecule ligands can be used to target quantum dots to specific proteins on cells. Researchers were able to observe quantum dots in lymph nodes of mice for more than 4 months. Scientists have proven that quantum dots are dramatically better than existing methods for delivering a gene-silencing tool, known as siRNA, into cells. First attempts have been made to use quantum dots for tumor targeting under in vivo conditions. There exist two basic targeting schemes: active targeting and passive targeting. In the case of active targeting, quantum dots are functionalized with tumor-specific binding sites to selectively bind to tumor cells. Passive targeting uses the enhanced permeation and retention of tumor cells for the delivery of quantum dot probes. Fast-growing tumor cells typically have more permeable membranes than healthy cells, allowing the leakage of small nanoparticles into the cell body. Moreover, tumor cells lack an effective lymphatic drainage system, which leads to subsequent nanoparticle-accumulation. One of the remaining issues with quantum dot probes is their potential in vivo toxicity. For example, CdSe nanocrystals are highly toxic to cultured cells under UV illumination. The energy of UV irradiation is close to that of the covalent chemical bond energy of CdSe nanocrystals. As a result, semiconductor particles can be dissolved, in a process known as photolysis, to release toxic cadmium ions into the culture medium. In the absence of UV irradiation, however, quantum dots with a stable polymer coating have been found to be essentially nontoxic. Hydrogel encapsulation of quantum dots allows for quantum dots to be introduced into a stable aqueous solution, reducing the possibility of cadmium leakage.Then again, only little is known about the excretion process of quantum dots from living organisms. These and other questions must be carefully examined before quantum dot applications in tumor or vascular imaging can be approved for human clinical use. Another potential cutting-edge application of quantum dots is being researched, with quantum dots acting as the inorganic fluorophore for intra-operative detection of tumors using fluorescence spectroscopy. Delivery of undamaged quantum dots to the cell cytoplasm has been a challenge with existing techniques. Vector-based methods have resulted in aggregation and endosomal sequestration of quantum dots while electroporation can damage the semi-conducting particles and aggregate delivered dots in the cytosol. Cell squeezing – a method invented in 2013 by Armon Sharei, Robert Langer and Klavs Jensen at MIT – has demonstrated efficient cytosolic delivery of quantum dots without inducing aggregation, trapping material in endosomes, or significant loss of cell viability. Moreover, it has shown that individual quantum dots delivered by this approach are detectable in the cell cytosol, thus illustrating the potential of this technique for single molecule tracking studies. These results indicate that Cell squeezing could potentially be implemented as a robust platform for quantum dot based imaging in a variety of applications. There are several inquiries into using quantum dots as light-emitting diodes to make displays and other light sources, such as “QD-LED” displays, and “QD-WLED” (White LED). In June 2006, QD Vision announced technical success in making a proof-of-concept quantum dot display and show a bright emission in the visible and near infra-red region of the spectrum. Quantum dots are valued for displays, because they emit light in very specific gaussian distributions. This can result in a display that more accurately renders the colors that the human eye can perceive. Quantum dots also require very little power since they are not color filtered. Additionally, since the discovery of “white-light emitting” QD, general solid-state lighting applications appear closer than ever. A color liquid crystal display (LCD), for example, is usually backlit by fluorescent lamps (CCFLs) orconventional white LEDs that are color filtered to produce red, green, and blue pixels. A better solution is using a conventional blue-emitting LED as light source and converting part of the emitted light into pure green and red light by the appropriate quantum dots placed in front of the blue LED. This type of white light as backlight of an LCD panel allows for the best color gamut at lower cost than a RGB LED combination using three LEDs. Quantum dot displays that intrinsically produce monochromatic light can be more efficient, since more of the light produced reaches the eye.QD-LEDs can be fabricated on a silicon substrate, which allows integration of light sources onto silicon-based integrated circuits or microelectromechanical systems. A QD-LED integrated at a scanning microscopy tip was used to demonstrate fluorescence near-field scanning optical microscopy (NSOM) imaging. Quantum mechanical models and simulations of quantum dots often involve the interaction of electrons with a pseudopotential. is the “quantum capacitance” of a quantum dot. The classical treatment of both two-dimensional and three-dimensional quantum dots exhibit electron shell-filling behavior. A “periodic table of classical artificial atoms” has been described for two-dimensional quantum dots. As well, several connections have been reported between the three-dimensional Thomson problem and electron shell-filling patterns found in naturally-occurring atoms found throughout the periodic table. This latter work originated in classical electrostatic modeling of electrons in a spherical quantum dot represented by an ideal dielectric sphere.